Indian weddings are forever big fat. No doubt, when we have to choose what saree to wear for the occasion we make sure it is not only traditional but trendy as well. Being Indians we are well-aware of the influence the diverse cultures have on our dressing style. Variation is always given a warm welcome and for once-in-a-lifetime events like wedding we prefer to look different but the best. A large variety of wedding sarees not only makes us happy but confused too. However, a list of various wedding sarees available in the market can help us to choose our attire for the Big Day wisely. Benarasi sarees come in various textures as Kora, Katan, Satin, Tussar and Georgette etc. Each fabric will have different types of weaving on it. For wedding usually Katan or pure satin/ double Katan is preferred as the weaving comes out gorgeous on it. Kanchipuram sarees are from Southern India and have the best quality silk thread and gold thread used in them to give thick and gorgeous sarees. They make a perfect wedding attire. Indian Baluchari sarees are made with three types of weaving patterns i.e. self resham , mina work resham and zari work on the handlooms of Bengal. The traditional mythological pallu and figure booties and borders are a must in a Baluchari. 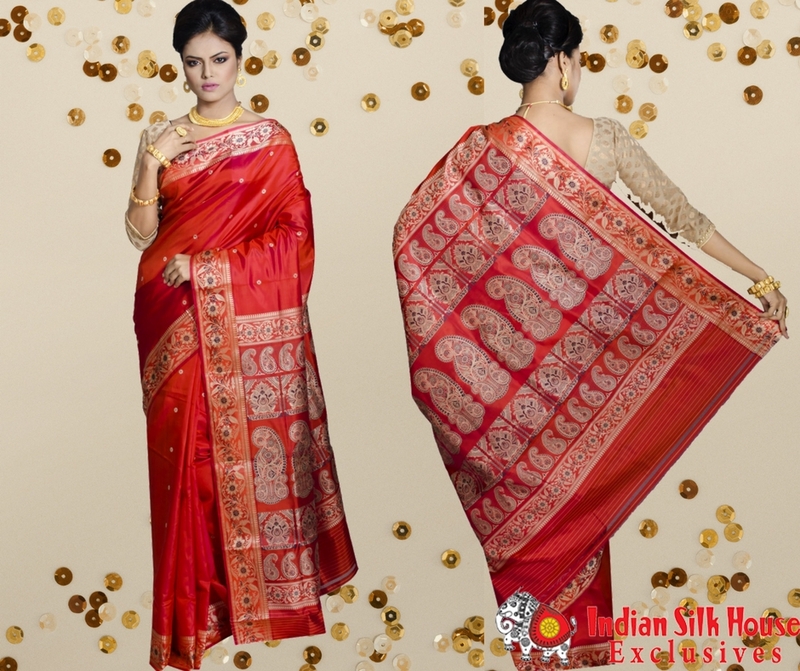 Art Silk sarees being thick, heavy and crease free, can be easily worn in the winter months. Although Art Silk being made of artificial fabric, they are look alike of natural fabrics and are good value for money. Having its origin in North-East India, its design clearly reflects the cultural aspects. It offers a unique 3-dimensional effect and makes use of attached woven border to give its signature look. The saree derived its name from the place of its origin, Chanderi. The fabric of this saree is fine silk blended with cotton and are best choices for summer wedding. The best way to choose the colour of your Wedding Sarees is to take your skin tone under consideration. Brides having a dark /pale skin tone can opt to wear shades like maroon , orange, strawberry pink, blue or emarald green. Medium or wheatish skin tone brides can choose any bright shade like maroon, hot pink, peacock blue or peach colour. Girls having a fair tone should go for shades like bright red, royal blue, or hot pink. Ready To Choose The Perfect Wedding Saree? A perfectly chosen Wedding Saree helps one to look stunning and royal like a queen. Drape them up in the most comfortable way to get the D-look. Just make sure that the saree you are wearing is a light-weight one and can be easily carried.